Simon Rodger revealed it was a "sad day" when told he has no future at the club. But he understands Trevor Francis' decision to bring the youngsters through and hoped to find a new club soon. 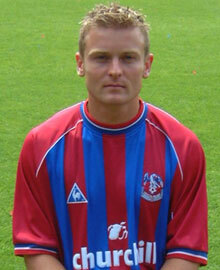 He told the Croydon Guardian: "I've spent a lot of my career at Palace so today is definitely a sad day for me. "It comes as a bit of a shock but I now have to look forward to finding a new club. "I think we have got to give the kids a chance and most teams are doing the same these days." He hopes to find a new club soon, maybe even dropping down a division, as he wants to stay in London. He will be getting married in May and his testimonial is on July 31 v Tottenham. He added: "It should be a great night for me and I'm really looking forward to it. It will give me a chance to say a big thank you to the fans for their tremendous support over the years." Rodger played his last game?